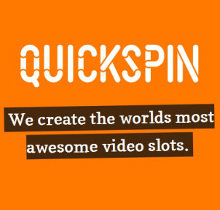 Hailing from Sweden, Quickspin is a development studio that specialises in online video slots. Primarily, they have developed games for the social casino market, but real money slots can be played at many online casinos. Scandinavian outfits like NetEnt and Quickspin have been pioneering slots output for some years now, and it's fair to say the experienced team at Quickspin have some good years ahead of them. Based in the gaming hotbed that is Stockholm, Quickspin boasts plenty of know-how among its founding team. CEO Daniel Lindberg spent time at NetEnt but hails from a telecoms background. Similarly, Mats Westerlund was in charge of design at NetEnt for five years, while the final component of this triumvirate Joachim Timmermans worked for Unibet before jumping ship. While, like NetEnt, Quickspin's main focus has been video slots, they signed a key deal with social casino bigwigs, Plumbee, in 2012 to provide games for their Facebook app, Mirrorball Slots. You're as likely to see top Quickspin slots for play-money on social media as you are real-cash games at leading casino sites. Quickspin's move up the 'social' ladder hasn't gone unnoticed - the firm won a 'Rising Star' award at the 2013 EGR Operator Awards, also bagging a gong for their Big Bad Wolf slot in the 'Game of the Year' category. In 2015, Quickspin signed a deal with innovative gambling site Casino Saga to provide their entire games catalogue across desktop and mobile platforms. 2015 was a busy year for the Scandies, with contracts also signed with BetVictor, LeoVegas, and Vera&John. These leading sites join the Rational Group (owner of PokerStars and FullTilt), Unibet and Coral in offering the firm's top slots. More award nominations came the same year, with nods for 'Innovation in RNG Casino Software', 'Multi-Channel Supplier', and 'Slots Provider' at the EGR B2B Awards. Let's kick off with their award-winner from 2013: Big Bad Wolf. Based on the Three Little Pigs fairytale, Big Bad Wolf was released in 2012 and boasts high-end graphics and bonuses. The 'Swooping Reels' feature was a first for slots and is triggered by any winning combination. It's been copied by pretty much everyone since, and comes in many forms (Cascading Reels, Tumbling Reels, Avalanche Reels, etc). Meanwhile, the big new game for 2015 - Razertooth - hit casinos with huge fanfare. It's Quickspin's first slot to feature 243 paylines. Elsewhere, Supernova - released on the Quickfire platform - borrows a lot from the trend of science-themed slots by featuring lots of neon on the reels, simple space symbols, and interesting multiplier bonuses. The game is played on two sets of reels - one 3x3 and the other 2x3 - with the first reels consisting of symbols and the other filled with multipliers. When Quickspin signed its deal with Plumbee, slots were just the tip of the iceberg. The pair recently signed an extension to the deal which now runs until 2017 and the move has meant a venture into other games like Mirrorball Bingo, on top of their current slots output. Launched in 2014, Mirrorball Bingo is a free-play social bingo app played on Facebook which lets players enjoy classic bingo online. However, the product was shut down in 2015 so that the firm could concentrate on slots output. Mirrorball Bingo barely made it to its 1st birthday.